I am proud to be associated with Scott's Bass Lessons and I did my first live online seminar in January. Myself and Scott go way back. So I was honoured when he asked me to be involved in his academy, alongside other esteemed educators such as Ed Friedland, Rufus Philpot and Damian Erskine. My seminar discussed a variety of ways to memorise scales and theory. 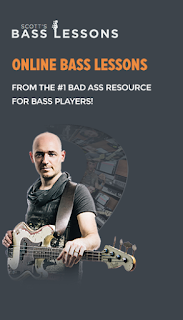 Scott's Bass Lessons is a fantastic online resource for bass players.